The HSBC Purchasing Managers’ Index (PMI), which measures activity in smaller factories, fell to 48.5 in February from 49.5 in January – with Chinese New Year a possible factor. China’s official PMI, which was released on Saturday and measures activity in big factories, fell to an eight-month low in February of 50.2 from 50.5 in January. Manufacturing is a key driver of China‘s growth, but the data may have been affected by the Chinese New Year when many factories were shut and workers went home in late January and early February. Expectations for the official PMI survey were for a reading of 50.1, while the HSBC reading came in as expected, marking the third straight monthly decline and a seven-month low. “Signs are becoming clear the risks to GDP growth are tilting to the downside,” Hongbin Qu, chief economist for China at HSBC, said. The index that measures new orders in big factories fell 0.4 percentage points to 50.5. The employment sub-index in the HSBC survey also fell for a fourth straight month to to 47.2 – its lowest level since early 2009. The employment index is one of few that measures the job market on the Chinese mainland. Despite the disappointing official PMI numbers, economists in China remained reasonably upbeat about the economic outlook . “Judging from market demand and production in some industries, we expect economic growth to remain steady in the future,” said Zhang Liqun, an economist at China’s Development Research Centre, which helps compile the official PMI data. China’s annual National People’s Congress, which begins on Wednesday, should see an official economic growth target announced for 2014. Premier Li Keqiang is expected to stick with a target of 7.5% growth for this year. In 2013, official data showed that China’s economy grew by 7.7%, though many question these official numbers. China has reported a small slowdown in manufacturing growth, underlining the challenges its new leaders face in spurring economic growth. China’s Purchasing Managers’ Index (PMI), which surveys big firms, fell to 50.4 in January from 50.6 in December. 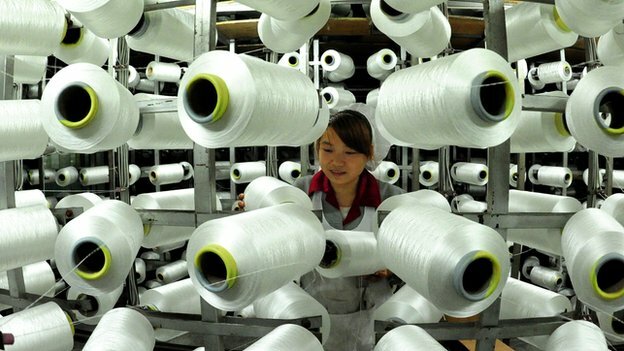 However, HSBC said its PMI for China, which surveys smaller firms, rose to 52.3 in January, from 51.5. Analysts said volatility in the two measures was normal and the underlying trend was that of a recovery. The PMI is a key indicator of activity in the sector and a reading above 50 shows expansion. “The economy is in the midst of mid-cycle upswing… there is sufficient economic momentum and political impetus to ensure a continuation of the current expansionary phase,” said Alistair Thornton, senior China economist at IHS Global Insight. He added that manufacturing activity usually slowed around the Chinese New Year, while a colder-than-normal winter had caused problems for some firms. The political situation may also have had an impact, he said. China’s manufacturing sector has been one of the biggest drivers of its growth over the past few decades. A key role in the sector’s success has been played by the availability of a large pool of low-cost labour, which has seen China become the destination of choice for many global firms looking to make goods cheaply. However, researchers at the International Monetary Fund (IMF) have said that China’s pool of low cost labour is likely to decline in the next few years. “China is on the eve of a demographic shift that will have profound consequences on its economic and social landscape,” Mitali Das and Papa N’Diaye, IMF’s researchers, said in a working paper released earlier this week. They added that the core of the working age population, those aged 20-39 years, has already begun to shrink and that China’s labour supply will cross a threshold between 2020 and 2025. They said that as the labour pool declines it will have “potentially far-reaching implications domestically and externally”. Such a shift will require China to rebalance its growth model from one fuelled by investment to one that is let by private consumption, they argue. In a separate release last month, China’s National Bureau of Statistics said that the number of people between the age of 15 and 59 decreased by 3.45 million to 937.27 million in 2012. Ma Jiantang, a director at the bureau was quoted by the China Daily as saying that it was the first such drop in “a considerable period of time”.